Leeds United defender Giuseppe Bellusci has been cleared of a misconduct charge by the Football Association. 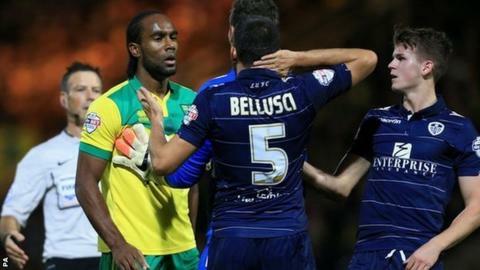 The Italian was accused of allegedly using racist language towards Norwich striker Cameron Jerome in the 1-1 draw between the sides last October. He would have faced a ban of at least five games if he had been found guilty. "Leeds is pleased to note the decision of the FA disciplinary panel to clear Bellusci of all charges of racism made against him," a club statement read. The 25-year-old is currently serving a two-match suspension after being sent off against Bournemouth on 20 January, his second red card of the season. Norwich and Jerome said they were "disappointed" with the verdict. "I'm glad the commission has said that they believe I truthfully reported what I genuinely believe I heard," said 28-year-old Jerome. "While I'm obviously disappointed with the not proven verdict, now I'm just focussing as always on my next game for Norwich City. "But I will always continue to report anything unacceptable I hear said to me on or off the pitch and I would certainly encourage any other players in a similar situation to do so as well. " Bellusci, who always denied the allegations, has made 20 appearances for the Elland Road side this season, scoring twice. FA director of football governance Darren Bailey said: "We will of course await the written reasons of the Independent Regulatory Commission, but it remains essential that the FA continues to bring forward charges where we believe there is a credible case to answer. "We fully and promptly investigated this matter from the moment it was brought to our attention and this underlines our commitment to the reporting process, which has been strengthened by both the FA and Kick It Out over recent years. "We note that the Independent Regulatory Commission stated that the complainant was a truthful and honest witness."